Shares of Boeing was steadily growing for several months. Today's Forex trading is unlikely to be an exception, most likely we will have growth, that we can use to increase your account with a forex broker. Tomorrow President Trump plans to visit the Boeing plant in South Carolina to personally attend the rollout of the first Boeing 787-10 Dreamliner. In the same state continues voting on the trade unions, the effect of which here is historically low. Boeing has made a major investment in the plant in the state just because of the fact that the authorities for a very long time lure company freedom from the influence of the trade unions. Today, earnings per share of the company is 7.66 and analysts cautiously predict growth stocks throughout the day in the forex market. All previously made trading recommendations on these shares has successfully reached the target with a decent profit. This trading tool significantly stands out against the background of blue chips, due to its potential and benefits for any trader. The action is useful as a medium trading tool on the market, and also for short speculation. 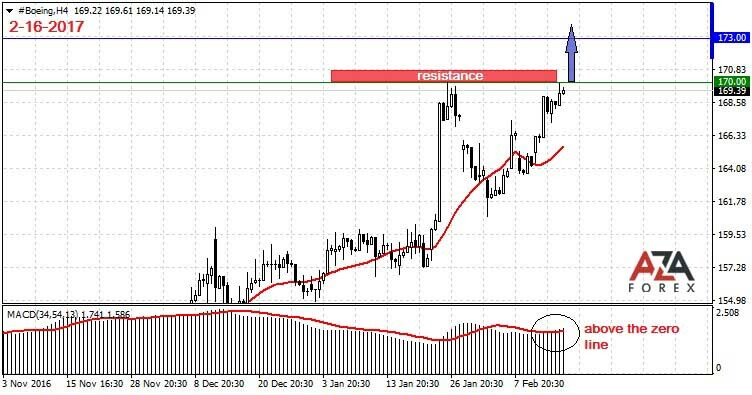 Again the price riches for its new historical maximum, and it means that we are again able to take advantage of this to increase the funds on the trading account with a broker, as in past times. This trading strategy is rarely misfires. Price departed not far away of high and stopped, indicating that the company has a good buyer who buys all he will get. Why hack a new road in the forest, if there is a trodden path?